Humans aren't the only ones who get excited when the sun starts to shine more and the weather gets warmer. 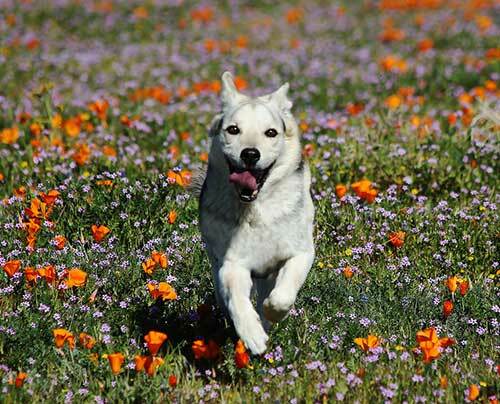 Dogs enjoy springtime after a long winter just as much as we do! After a whole season spent indoors, here are some activities brought to you by our expert dog trainers to do with your dog now that spring is upon us. A camping trip may be the perfect way to celebrate the return of warm weather. And the best part? Your dog will have just as much fun as you! Camping trips can be a blast for dogs of any size, and it will give the two of you time to bond while you explore the great outdoors. You can choose to rough it in a tent, or try out a dog-friendly cabin. And don't worry if you can't get away; you can plan an impromptu camping trip in your own backyard. Either way, your pup will enjoy the chance to get some fresh air. Swimming can be a hit or miss for dogs; some can swim, and some can't, so this activity really depends on your dog's ability to do it and enjoyment of it. If your dog is a lover of swimming, take advantage of the warmer weather and have some watery fun. Find a dog-friendly beach or a nearby lake you two can splash around in. Some public pools even have days you can bring your dogs. If your pup isn't one for swimming, try creating a splash zone in your backyard with sprinklers and play a game of fetch! Most dogs love the opportunity to hike. Just be sure to keep a watch on your pup as they can overheat easily, and bring enough water for both of you. And don't forget to have a first aid kit and poop bags. Find a hiking trail near you that allows dogs and have some fun! After a long, cold winter, finally being able to go outside and get their energy out is a treat for your pup. Chances are you may be feeling some cabin fever too. What better way to embrace spring and get you both back into shape than to exercise together? There are more ways than you may think to exercise with your dog. You can go for a walk, a bike ride, a jog, play Frisbee, or even do yoga together (yes, there is such a thing as yoga for dogs!). Dog parks are also a great place for exercise and socializing. You can meet other dog owners while your dog makes some new friends. If you just want to enjoy the gorgeous new sights of spring, take your dog out for a ride. Most dogs love the excitement of driving. Load up your car with all the day's essentials and take a trip to the beach or mountains, or just to the mall or park. Or don't have any destination in mind and just enjoy the ride! Make sure your dog doesn't get motion sickness while staring out the window, though. Any activity that lets you and your dog bond is a day well spent. Enjoy the warmer weather and have some fun with your pup this spring season! Do you have any questions or concerns? Contact Dog Training Elite today to speak to our professional dog trainers, we're happy to help!